Cross shaft in two pieces, upper piece, south. Cross shaft in two pieces, dated to late ninth century or early tenth century. Top of upper piece, south view. The horizontal strip at the top of this piece is roughly dressed. Below the horizontal strip an angel occupies each corner. Each stretches an arm diagonally down towards the centre. 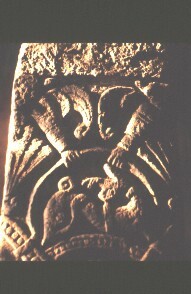 Enclosed within a semi-circular frame held by the angels and resting on the top of the next panel there is a beast in profile, with its head thrown back.